The monitoring of chemical substances, as required by the MSFD, should allow for the seamless protection of waters against chemical hazards. EU Member States shall consider contaminants and their total releases (including losses, discharges or emissions) which may entail significant risks to the marine environment from past and present pollution in the marine region, sub-region or subdivision concerned. A list of priority substances identified in EU coastal and territorial waters, as laid out in the Environmental Quality Standards Directive [2008/105/EC] and its amendment [2013/39/EU], is provided in the Water Framework Directive Strategy (WFD) on Priority Substances (PS). EU Member States may also identify in their coastal waters substances of national or local concern (River Basin Specific Pollutants) for control at the relevant level. Furthermore, the MSFD provisions foresee the consideration of areas that are not covered by the WFD. Such contaminants include marine-specific substances and contaminants such as hazardous and noxious substances resulting from acute pollution events. While prioritization lists through the WFD and RSCs exist, there is need to also take recent or spatially limited contaminant issues into consideration. 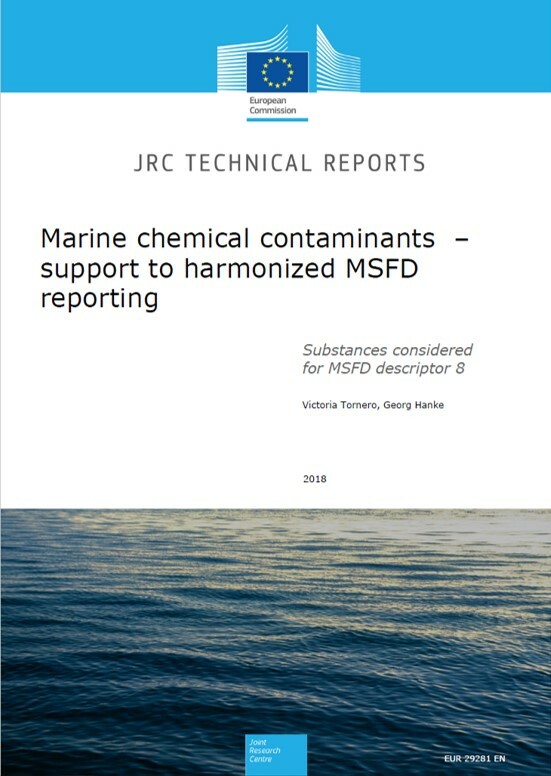 JRC is contributing to the identification and selection of MSFD relevant contaminants. Chemical substances occurring in the marine environment might derive from specific sea-based human activities, such as shipping, antifouling agents, aquaculture, ammunition dumping, etc. 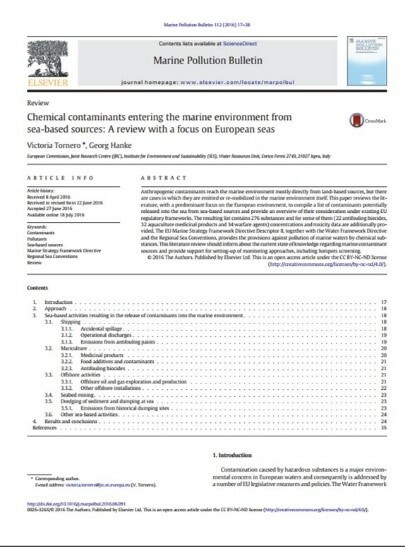 Two recent publications review the literature to identify contaminants potentially released from these sea-based sources, providing an overview of the policies and frameworks for their management and regulation within the EU. 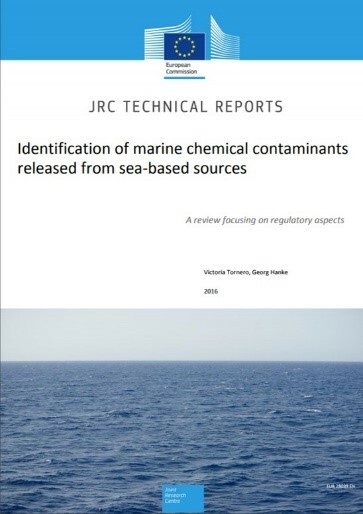 The JRC has also recently published a compilation of regulated or identified priority substances under relevant conventions, European legislation, and dedicated research work in order to support further developments for the monitoring and assessment of chemical pollution in the marine environment. The 2018 reporting on updates of the MSFD Articles 8, 9 and 10 is supported by web forms to aid completion of the XML files by Member States. This report outlines a process to prepare a list of contaminants for use in 2018 MSFD D8 reporting (as drop-down lists in the reporting web forms). 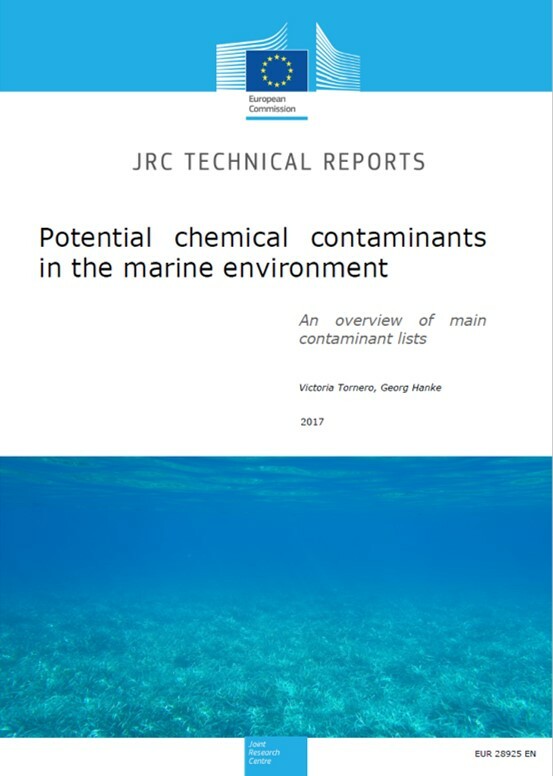 This compilation also allows us to compare the substances considered by Member States and marine regions, with a view to supporting the processes of selection of relevant contaminants for D8 assessments. The MSFD also considers the effects of pollution on the ecosystem components concerned, having regard to the selected biological processes and taxonomic groups where a cause/effect relationship has been established and needs to be monitored. A technical report on effect-based tools was elaborated by the sub-group CMEP (Chemical Monitoring and Emerging Pollutants) in the context of the WFD. The occurrence, origin (where possible) and extent of significant acute pollution e.g. through oil and oil product slicks and their physical impact on biota should also be considered under MSFD. The European Maritime Safety Agency (EMSA) provides oil spill satellite surveillance to the EU coastal states. National aerial and vessel surveillance patrols can then target the area to verify the possible spill and potentially identify the polluter. This communication and verification process can be triggered through the MSFD. Environmental Quality Standards (EQS) have been established for priority substances under the WFD. In absence of EQS for specific substances and/or matrices other than those specified, EU Member States could apply other assessment criteria agreed at regional or subregional level, such as those developed by Member States at national level or within RSC.